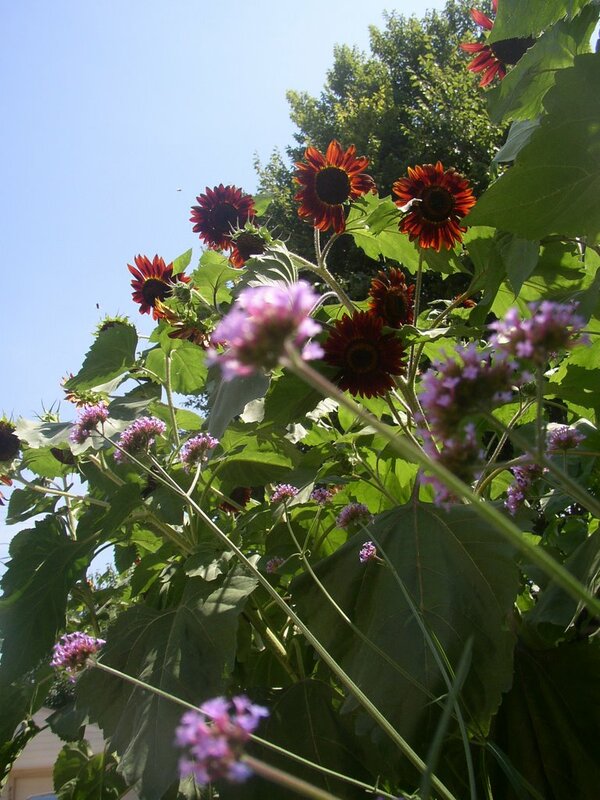 It has been a beautiful weekend--we got our "Indian Summer" after all, just a little later than usual! I spent a good amount of time outside today, cleaning up peony and hosta leaves and spreading mulch. Yes, I know it's too early for winter mulching, but the rest of the pile had to go so we could get our cars inside this winter. Most of the fall foliage colors are fading, but I was surprised to see so much in bloom around the yard. Next to the side door are my potted 'Goodwin Creek Grey' lavender and a 2-year-old 'Arp' rosemary that are enjoying some cold snaps before they come indoors for the worst of winter. The lavender pot is too heavy to move more than once, but I brought the rosemary out front--near the 'Bressingham Ruby' bergenia, which is sporting its winter color already--to better show off its pale flowers. 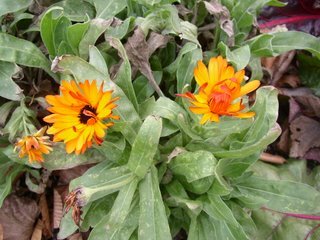 In the backyard, a few valiant little calendula plants were still offering cheerful blooms. I had cut them back late in the summer to their basal foliage when their scruffiness really started to get to me. They all gave me rebloom at their new shorter height. 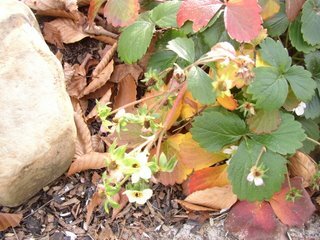 Last but not least, my alpine strawberries are still blooming like crazy. There are no fruits for their labor, but since I walk past them to get to my car every morning I appreciate them nonetheless. I have a few other pictures to share, and posts brewing... but I will be out of town until late Tuesday night and then have tournament games for our indoor 4's volleyball league on Wednesday night. So I hope to squeak in a post on Henry Mitchell sometime Thursday, to make the November Garden Blogger's Book Club deadline! In early March, as I cut milk cartons and leftover plastic bags to make more winter sowing containers, I thought back through previous seed sowing adventures. In 2004, I had been excited about direct sowing Love-Lies-Bleeding (amaranthus caudatus) as well as a hybrid amaranth called 'Hopi Red Dye' that was reportedly used by the tribe as a ceremonial coloring for cornbread. None of the seeds had germinated. On a whim, I dropped my scissors and pulled out my old seed packets. I did find some seeds in the bottom of the 'Hopi Red Dye' packet, so I prepped a couple of extra containers and scattered them across the top. 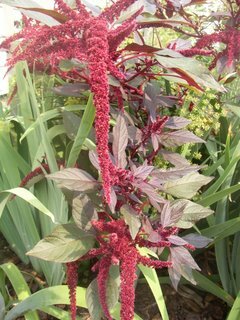 All of the amaranth containers showed germination a few weeks later, and I planted out more than a dozen hunks of seedlings in the late spring. By the time the iris were done blooming, the amaranths had started shooting up out of their seedling clumps and some were even forming flowerheads. I pinched out the green ones but left all of the darker-foliaged seedlings, figuring that the weakest ones would die out on their own. That did not necessarily happen, as I ended up cutting down thick individual stalks growing a mere inch apart during fall cleanup. My one regret with my 'Hopi Red Dye' is that I did not fully explore its culinary uses. The plants were so fascinating ornamentally that I simply sat back and enjoyed the show. 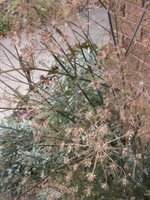 The iris appeared to help keep them from tumbling down onto walkways, and they fraternized freely with everything from miscanthus zebrinus to bronze fennel. When a stiff wind felled some of the more top-heavy specimens, I discovered that they made great garden decor and were a favorite of the birds in the early winter as well. A few branches are still hanging in my kitchen, adding some interest to a plain green wall and the doorway to my basement stairs. I will be growing the amaranths again in 2007 for sure... but right now I have my eyes on trying the gorgeous, golden 'Hot Biscuits' instead of doing the 'Hopi Red Dye' again. 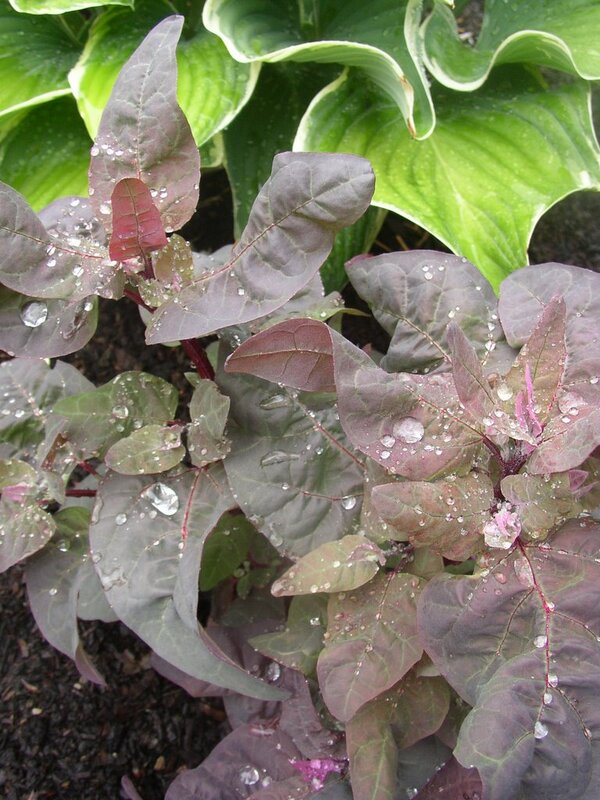 "Ruby Orach Mountain Spinach" was another winter sowing success story. Really atriplex hortensis var. rubra, the young leaves taste best fresh. 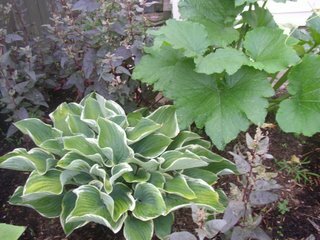 I tucked in wintersown seedlings here and there in the garden, nestling their reddish purple leaves next to 'Paprika' achillea, grasses, and a variegated hosta. The leaves were particularly fun to check out after a rain, as the water beaded on them like it does on alchemilla mollis. 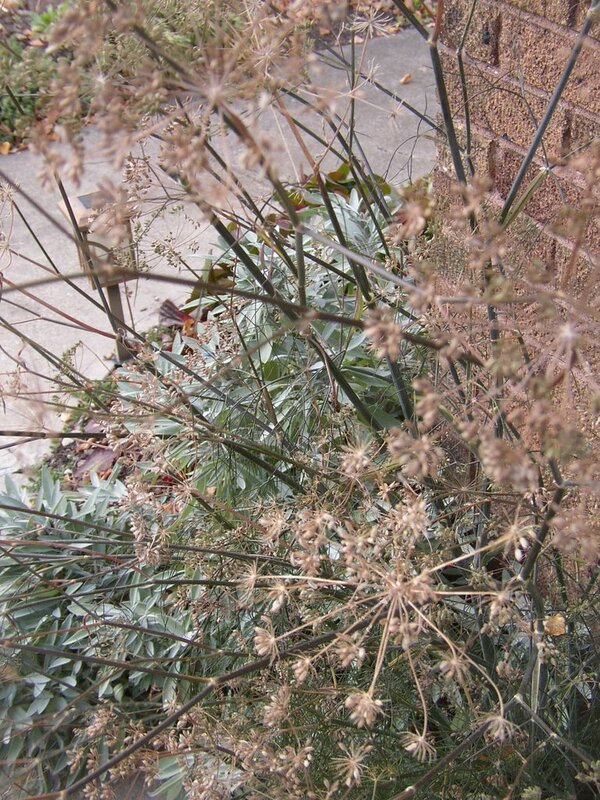 I've heard that you should cut back the flowerstalks before seed can set, because atriplex hortensis has a reputation for reseeding prolifically. I followed this advice in the front yard but let the backyard plants go for the most part. I wouldn't mind some reseeding there anyway, and would gladly add more to my spring weeding chores in exchange for having enjoyed their bleached, wheat-colored skeletons all fall. 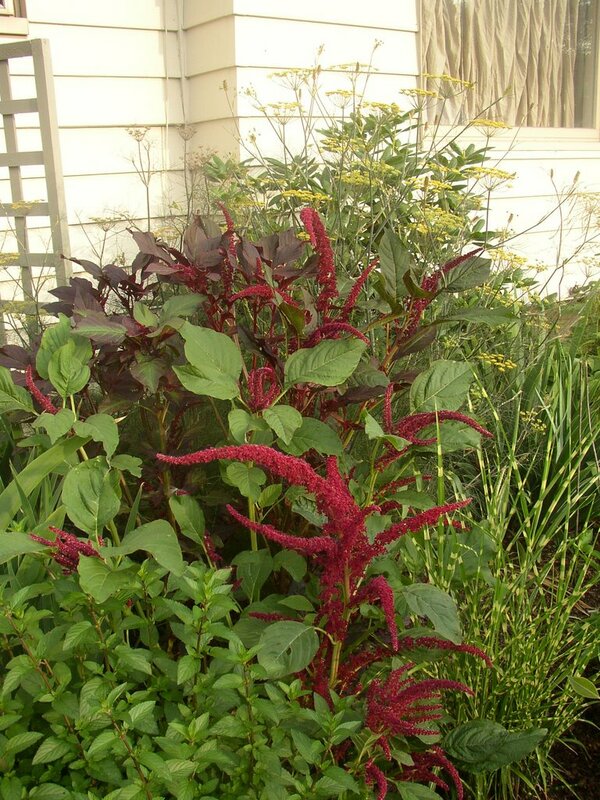 I may buy some additional seeds this winter just to ensure that I get a few plants... even if I have to overlook how they turned a distressingly bright pink in the late summer. 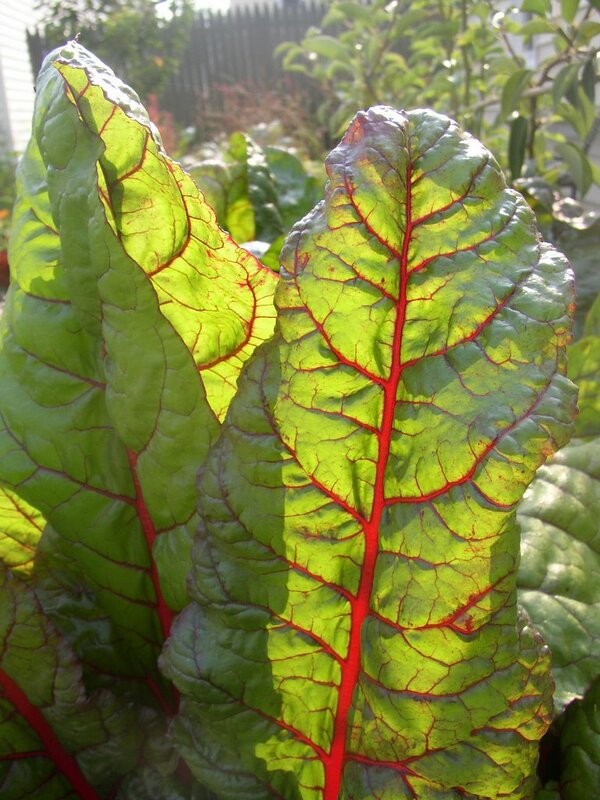 One last favorite in this category is 'Rhubarb' Swiss chard. All summer, the leaves caught the sun and glowed a bright golden green. 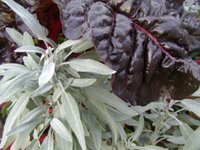 The thick rubbery leaves provided good contrast for everything from the grassy foliage of dianthus to the soft, fuzzy silver of 'Newe Ya'ar' culinary sage. I feel like I should think of this as an "ornamental edible" instead of an "edible ornamental," though, because I ate a whole lot of it this year! 2006 was either a good year for chard or I have been guilty of underestimating it. I frequently sauteed it in a bit of olive oil and a lot of garlic, and served it over whole wheat pasta with some asiago cheese for a quick supper. 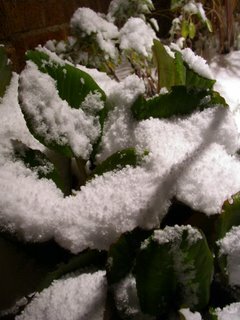 By the end of the summer I had acquired a taste for eating the younger leaves raw while puttering around in the garden. I had plans to harvest the remaining chard at the end of the season and follow Patrick's advice on dehydrating it for later use. But I so enjoyed the leaves as they turned a dark inky green in the fall that I never did get around to picking it. 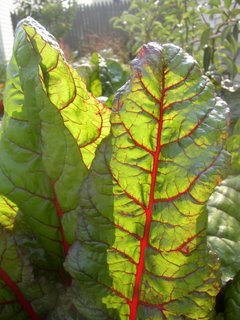 I am definitely growing some type of chard next year, though--maybe one with yellow/white veins. And if I don't like the way it looks, well... that just means I'll have to eat more of it! 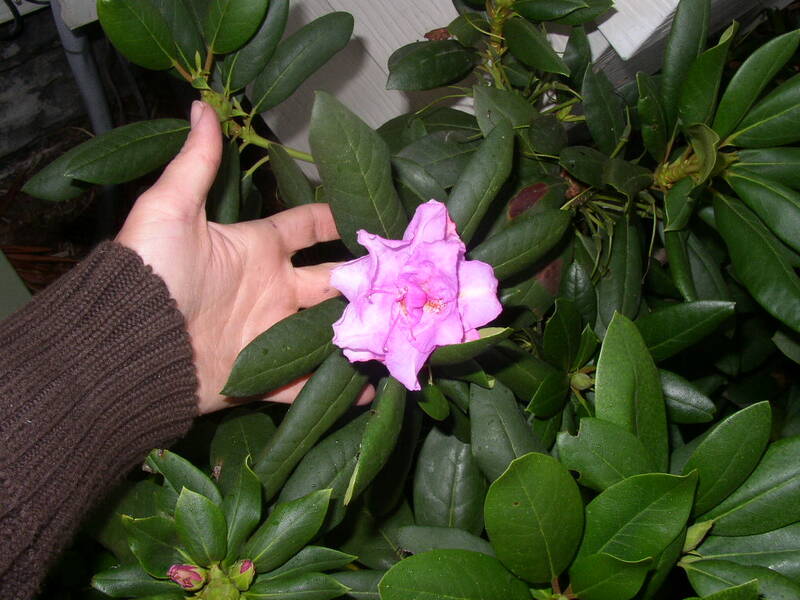 I was thinking about how you used the Easter Peep to rig "forsythia bloom" evidence as I went through my garden pictures this afternoon... because I found a picture of my own rhododendron blooming last fall! 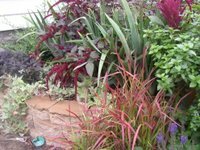 I put in a lot of smaller perennials and shrubs in the fall of 2005, mainly good deals from a local garden center that was going out of business. Like a good gardener, I dutifully planted at the proper distance, ignoring the fact that some of the plants looked quite forlorn and stranded that way. The more I looked at the new plantings, the more apparent it became that there was plenty of room for annuals in the garden. I had lots of temporary spaces to fill. My resolution to add annuals this year left me with a little trepidation. 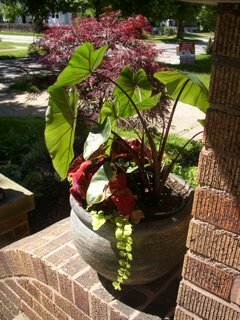 I had always put together some wacky combination of annuals in a planter or two on the porch, but mostly shied away from using annuals in the garden beds. See, designing a garden with herbs and veggies is exceedingly easy in one respect: Anything you do to make it look less like a farm and more like a landscaped bed is a huge achievement in the eyes of the general public. Most people think of those things as mere edibles, so showcasing their ornamental qualities proves you're clever. When you step into the wonderful world of annuals, though, you're treading on thin ground. Everyone and their brother knows what marigolds, sunflowers, begonias and even coleus are... and, worse, they all have their own ideas about how these plants should be used by good gardeners. I clearly needed to do some homework in this area, so each time we went to the bookstore I made a point of leafing through books and magazines devoted to the use of annuals and color in the garden. There were some great ideas in these resources, but mostly I yawned at the overused combinations, the old standby annual plants, etc. It was probably mid January when I decided that if I was going to do annuals in the garden, I was really going to DO annuals in the garden. I resolved to use big annuals. Colorful annuals. Things I never would have grown in my old garden for fear of the "jungle" jokes and raised eyebrows they would undoubtedly earn from my former husband. And then the real research--and fun--began! Tonight was relatively warm and the wind was surprisingly still. My head was too full of thoughts in that way that only physical activity can alleviate, so after a quick supper I ventured outside to rake leaves. Coco quickly settled into her favorite front yard spot to survey the other goings-on in the neighborhood. There was a surprising amount of activity on the street for after dark: Random comings and goings, dogs being walked, and an impromptu game of keep-away with a football down the street. 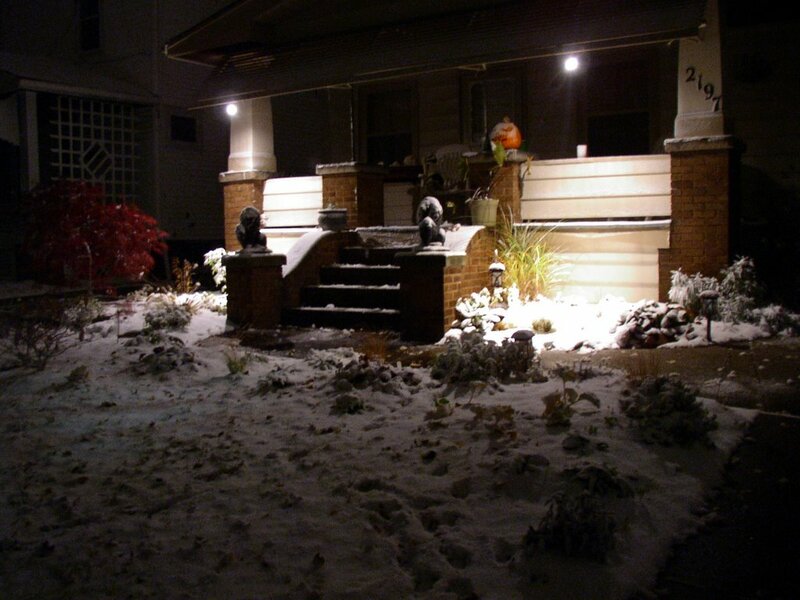 It briefly occurred to me that I would like to have a digital camera that takes better pictures at night, to better chronicle the easy feeling of such an evening in photograph form. The fallen leaves of the Japanese maple carpeted the ground below its gnarled branches and spotted the thyme plants with crimson and red. I left them in place as I worked my way around the rest of the plants... meticulously cleaning around things like lavender and sage that hate winter moisture but giving other plants just a quick once-over with the rake. Between an unnamed heuchera and a golden sage, my rake got stuck momentarily. I heard my voice say, "What the...?" at the same time my brain thought, "Uh oh... that's the butterfly weed!" My arms stopped pulling and I bent over to more gently untangle the tines and make sure I hadn't pulled the plant out. That's when the light caught it: A seedpod, impaled on a tine, with white silky threads bursting out of its seam. I had stalked all of the butterfly weeds, which I winter sowed this spring, but recently gave up on being able to harvest any seeds from them. I figured that I was just lucky they all had bloomed in their first year. I carefully picked up all the seedstuffs that I could find, and deposited them safely inside before resuming my task. 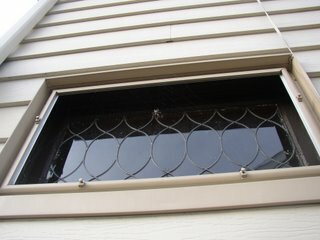 Almost a week ago, we caught site of the spider fixing his web in the afternoon sun. It would be the last work he would do on it, as a lack of food and continuing cold temperatures were the end of him before the weekend... but it provided the first and only good picture I was able to get of him. You can see his markings and even make out that he was minus one arm on his right side, if you click to enlarge the shot. I'm not exactly sad that he is dead--not because I'm cold hearted, but just because that is the natural cycle of life. The optimist in me appreciates fall's endings even as I collect seeds and envision the new beginnings that await in the spring. Luckily, I have a long Cleveland winter's worth of time to make a few decisions about next year's growing season. 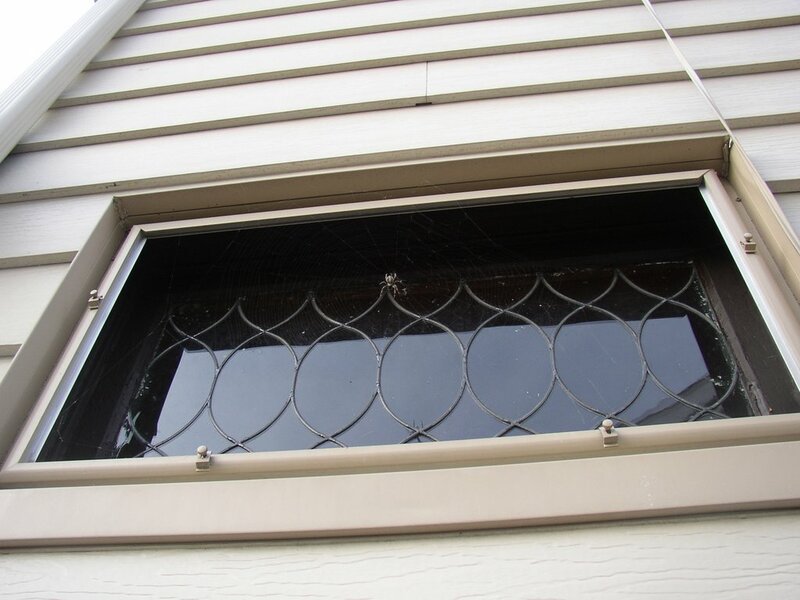 I will need that long to decide whether it would be completely silly for me to take that storm window off again next summer, just to see if we can attract another spider to observe... and whether even that would stop me from doing it anyway. If I had to describe my approach to color with one adjective, I would probably use a word like quirky. Or experimental. Maybe nontraditional. I like rich, dark colors but would not call myself avante garde, trendy or flamboyant. 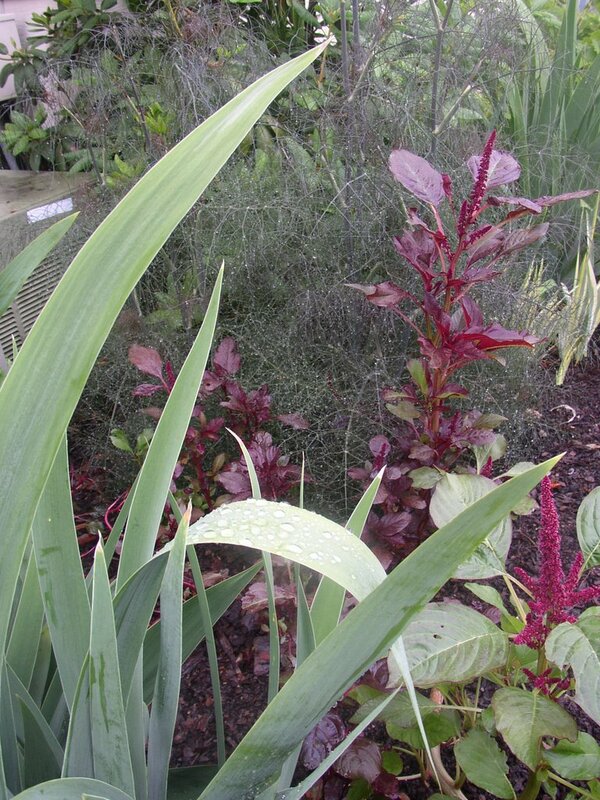 I don't jump for every new color introduction but I do like to raise some eyebrows with unusual plants--caramel-colored sedges, anyone?--or plant combinations. Sometimes I wonder what keeps my garden from becoming a riotous mess of color (in a bad way) with the purples, blues, reds, and oranges all tucked into a relatively small space. I think that one thing that saves my garden from garishness is my affinity for silver-foliaged plants. 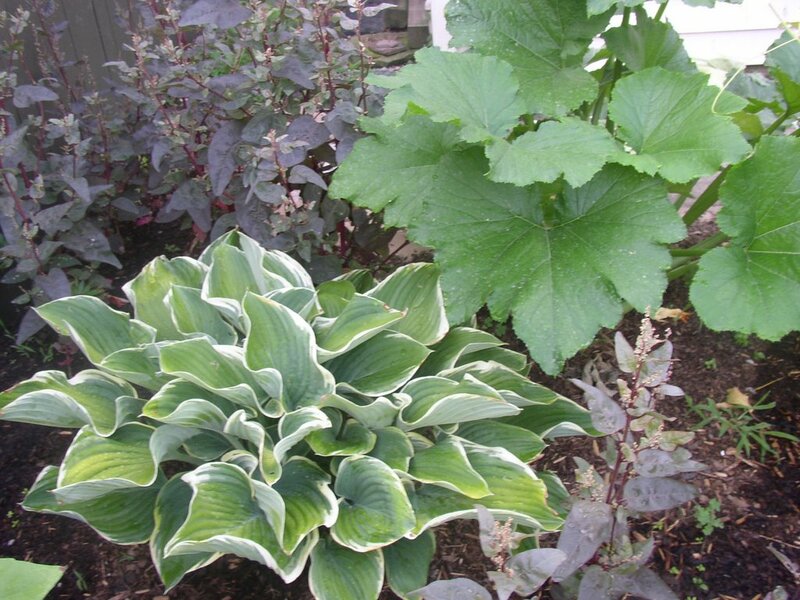 Silver plants function in my garden much like a neutral matte used on all of the pictures that hang throughout a home, providing a sense of cohesion through the repetition of neutral color. 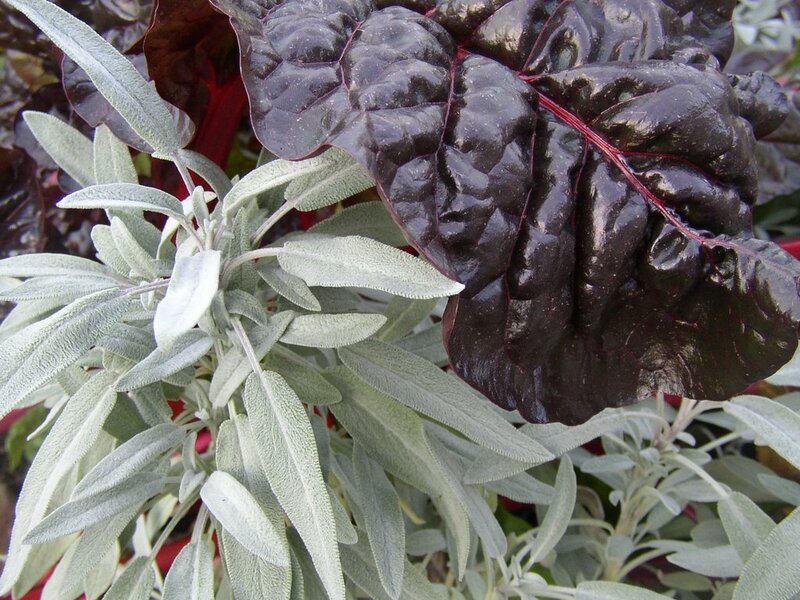 Silver--really grey or grey-green--foliage tones down hot colors and brightens cool shades. Unlike white flowers or variegated foliage, silver does this without adding to the "noise level" in the garden or calling undue attention to itself. I would love to say that I'm such a brilliant gardener that I had planned to use silvers for the above reasons all along... but that's not true. If you had asked me this summer what I thought of silver plants, I would have immediately thought of the often-overused annual, dusty miller. 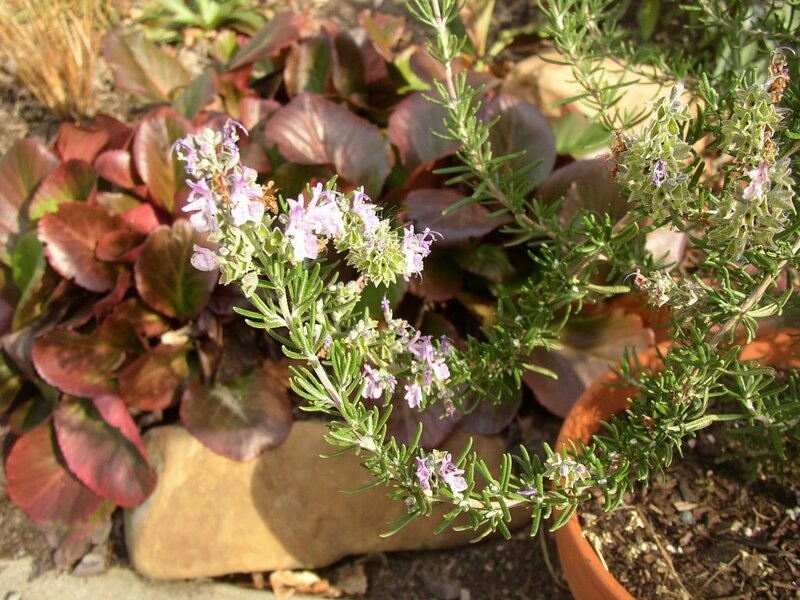 My inner plant snob would have answered, "Ugh," not even realizing that plants like santolina and sage were quietly taking up residence in my garden as I opined. How did they sneak up on me? 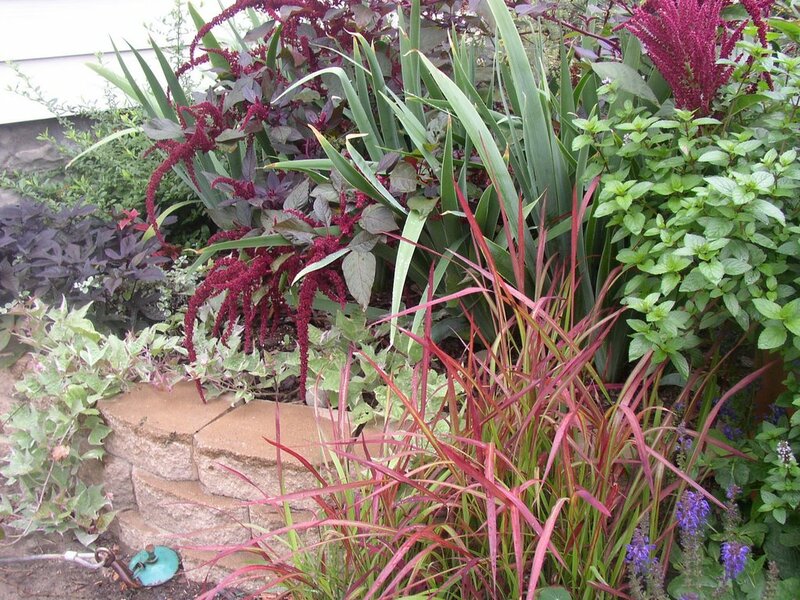 First, I'm a self-professed lover of contrast who grows many plants with purple and red foliage, so it was hard to resist using silvers as foils for the darks. Even humble plants like 'Newe Ya'ar' culinary sage and red-veined 'Rhubarb' chard can look like dramatic events when grown side by side. 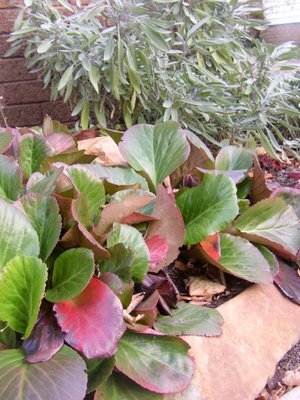 Second, many silver-foliaged plants are either drought-tolerant, aromatic, or both. 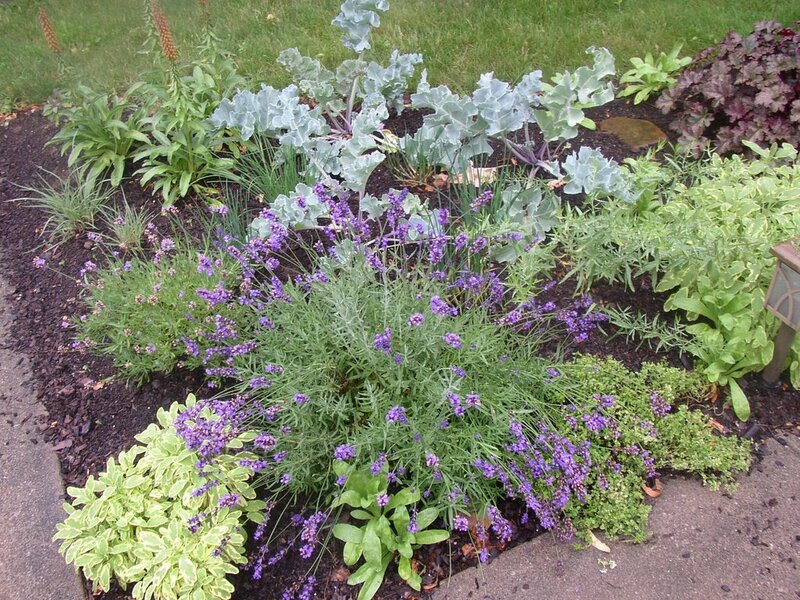 Tough plants work well with my survival of the fittest gardening philosophy, and I am also more apt to select an herb or edible than a "mere" ornamental plant to fill in a space. In a small garden like mine, plants really need to do double- or triple-duty! Lastly, I would like to think that I somehow knew--or intuited--that silvers would knit a garden together so well. I'm really not sure that I can claim an artistic eye, though. It may very well have been merely a happy accident. In fact, if silvers didn't combine so well with browns, tans, and reds in the autumnal garden, they might still be flying under my radar. I started thinking about what they do during the rest of the year after the freshness and elegance they add to the fall garden caught my attention. Now that I've noticed them, though, I will have to be more intentional about including them in my garden plans for the future. 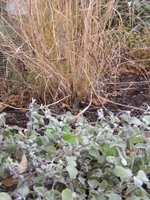 Any gardeners out there have a favorite silver plant--annual, perennial, or small shrub--that I might not have tried but should? In addition to herbs like lavender, santolina/lavender cotton, curry plant, and sages, I have grown 'Jack Frost' brunnera, licorice plant, and 'Silver Falls' dichondra. I would love to expand my silvery horizons next year... and maybe even torment my inner plant snob by finding a cool way to use that darn dusty miller! 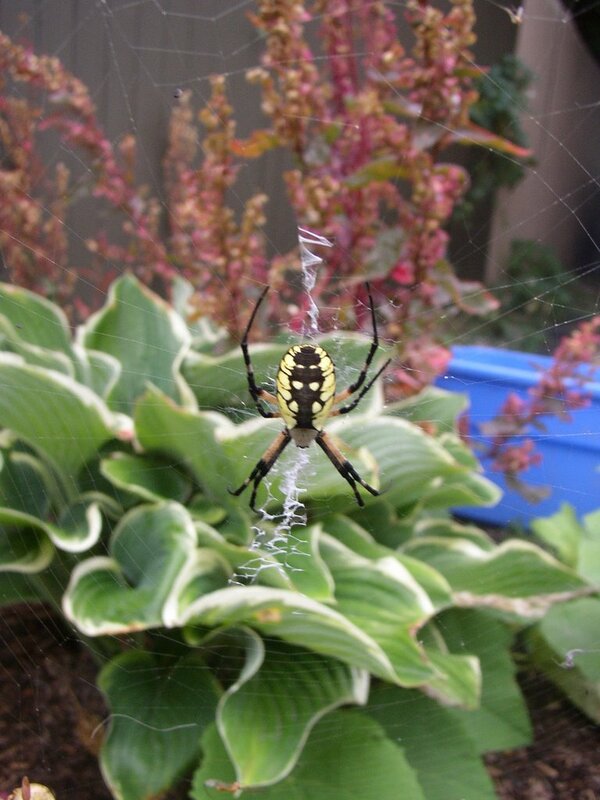 My resident spider is still alive! I thought that last week's cold weather and snowstorms might have done him in, especially since I didn't see him move from the inside of the window frame for several days. Last night, however, we saw him finally venture back out to repair his web. 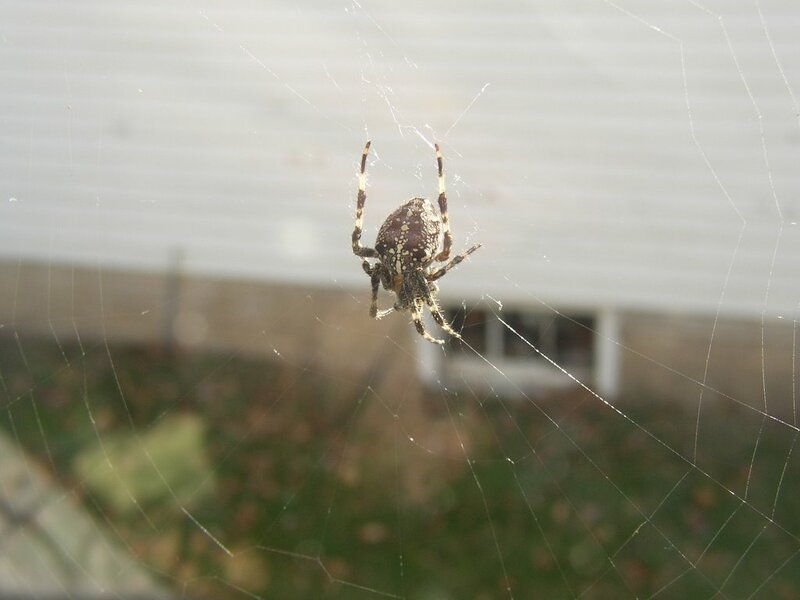 Today I got one good picture of him in the middle of the web before he retreated to the safety of the window frame ledge. I love how he sits on that ledge--two of his seven legs slung casually over the frame, both touching the web so he can monitor its movement. Seriously, if I have to have a BeeGees song in my head, why can't it be Jive Talkin'?! During the summer of 2005, I worked part-time at a local garden center. One of my first tasks in the spring was to go through last year's shrubs and trees to determine which ones would be sellable and which ones were not. I waded through the pots of shrubs, arranging the salvageable ones in a small circle, pitching the dead ones directly in the dumpster, and setting a handful of questionable plants aside for further review. As the manager looked through the "maybes," he nixed a small mountain laurel, 'Olympic Fire' kalmia latifolia, that I had almost placed in the save area from the beginning. Sure its leaves were a bit desiccated by the winter winds, but the couple of branches I had lightly scratched with my thumbnail showed living green tissue underneath the thin bark. I tried to bite my tongue--after all, this was only my first or second day of work--but I couldn't hold back for very long. "Um... you know that mountain laurel you said to pitch? There's a lot of green under the bark. If you don't mind, I would like to try and save it. We could put it back behind the fence there so customers don't see it until it's rehabbed..."
The manager, who I would come to know was a really great guy, looked at me, and then at the mountain laurel, and then back at me. "Well, we could do that," he said slowly, "but I think that it might get more TLC at your house. So if you want it, why don't you just take it home and see what you can do with it?" And so the mountain laurel came to live at my house last spring. It didn't do much during the summer--didn't look a whole lot better than it did when I planted it, but didn't look any worse, either. 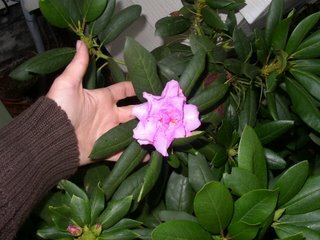 I gave it the occasional deep watering to help it establish a good root system, and pruned off a couple of dead branches in the late winter. This year, it didn't put on any noticeable growth but I did get two clusters of flowers. I pinched one cluster back immediately, but let the other cluster bloom for a couple of days before I punched that off as well. I watered it deeply once, during a midspring drought, but otherwise left it alone. With all of the bed construction and plant moving that I have been doing this summer and fall, I mostly forgot about the mountain laurel until I was planting bulbs last week. As I took photographs to chronicle where the bulbs were planted, I noticed buds at the end of each and every branch of my mountain laurel and took a picture of them as well . 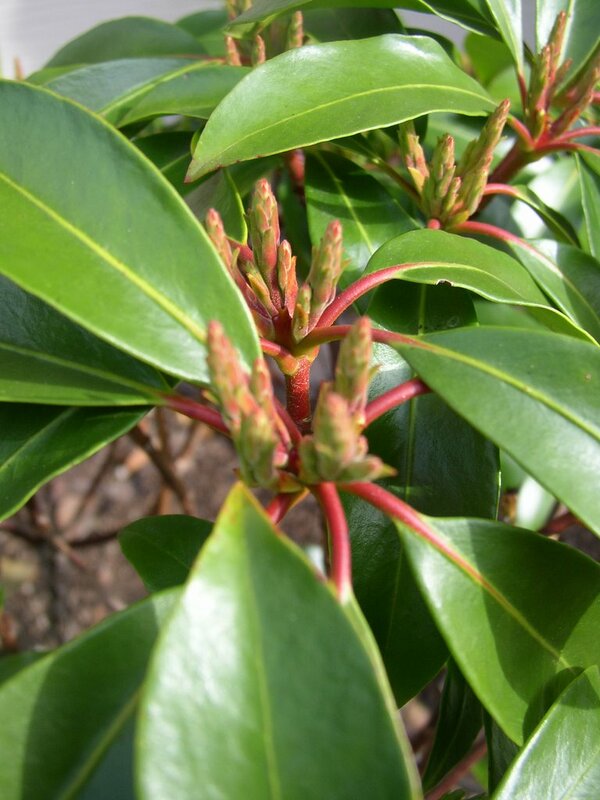 Will the buds sprout new leaves in the spring? Will they be clusters of flowers? I haven't had the plant long enough to know, but I am heartened by seeing these signs of new growth in the fall. As the temperatures drop, it's very nice to have a promise of interesting things to come. I'm not ready for this... not quite yet. I have crocus sativus and deep purple tulips to plant. There are lasagna beds to layer, annuals to clean up, lawn to edge, and leaves to rake. I'm really not ready for this... and yet I couldn't resist spending some time outside drinking in the cold, clear beauty of this first snowfall. The neighborhood was quiet, still, and crisply white. I could swear that there must be wonderful, mysterious things waiting to be found on the other side of each warmly lit window I passed on my walk... the houses all look "lovely, dark and deep." But these mysteries are not mine to discover, not this evening. Like Frost, I have promises to keep--and miles to go before I sleep.